Johnny Shockley sees aquaculture as the key to preserving the Bay, and watermen like himself. Ten years ago, Johnny Shockley came face-to-face with a future he couldn’t fathom: One day, perhaps soon, he’d no longer make his living as a waterman. The third generation of his family to fish the waters around Hoopers Island, he’d oystered and crabbed with his father from a young age. They gave up on oysters after the Chesapeake Bay oyster populations collapsed, sticking with blue crabs. Those declined too. He spent two decades running the family’s retail seafood market in Salisbury. Then it closed. He discouraged his son from crab-potting and was convinced he couldn’t hold on much longer either. “When the supply starts to fail, everyone starts to grab what they can in order to survive. And the guys with no say are the watermen,” Shockley says. He even lobbied for a radical-but-doomed individual quota-based commercial crab harvest system that would have allocated shares to active watermen based on historical reported harvests, but the watermen community at large couldn’t see a way to make it work. When that fizzled, “I lost my spirit,” he says. “There was no upside; the fisheries were overfished,” an uncharacteristic thought from the man his friends know as a glass-half-full guy. Shockley wasn’t alone, of course. 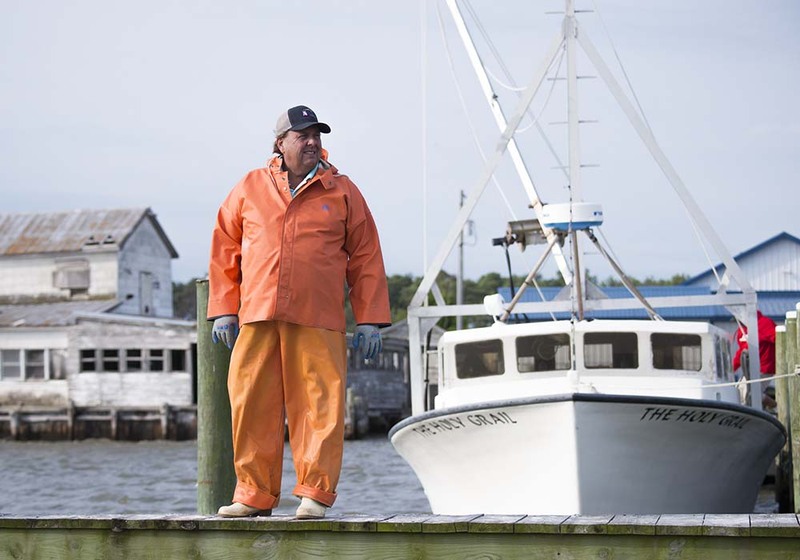 In Dorchester County, where he lives, watermen staked their chances on the mercurial crab stocks or, like Shockley’s colleague Bobby Gootee, reluctantly took other work. Gootee built hospital beds in Cambridge until the manufacturer moved its operation to Mexico. As anyone who knows Shockley will tell you, though, he’s an entrepreneur at heart. Without forsaking his calling, he fashioned a successful new career from the fragments of a dying industry—oyster farming. Now he can’t stop preaching aquaculture’s benefits to anyone who’ll listen. Which explains why, on a warm June morning as most watermen are hauling crab pots, he’s driving down a marshy peninsula bounded by Fishing Bay and Hooper Strait. He’s headed for Crocheron, a hamlet with a population of 18, according to the 2010 census. Its last major industry closed in 1995, a seafood packinghouse that employed nearly twice as many people in its heyday than inhabit the town today. There are at least half a dozen fishing villages like this one in remote, low-lying southern Dorchester County, where modest, well-kept homes keep company with renovated weekend retreats. Here and there, Shockley passes a weathered ex-dwelling, abandoned now to prying vines that peer in broken windows. He points to one of the weekender homes. He knows its owner—a good guy, he says—but not the 12-month-a-year resident it takes to populate communities like the one Shockley grew up in, the kind he hopes—make that believes—his new line of work will rebuild. The 55-year-old Shockley, a burly man with a ready smile and shaggy hair that spills down his forehead, co-owns a business in Crocheron (pronounced CROW-chur-on). Dominated by a one-story white building with a bright blue roof and a long wooden dock, the property superficially resembles the seafood houses that once dotted this portion of the Eastern Shore. Except that Shockley’s facility has year-round employees who don’t shuck, pick, can, or freeze local seafood, as county residents have for more than a century. In 2010, Shockley and Dorchester businessman Ricky Fitzhugh co-founded Hoopers Island Oyster Company, an aquaculture firm that now leases 365 acres of the Chesapeake in which to grow caged oysters above the Bay’s silty, overfished bottom. The Crocheron facility on Tedious Creek, a Fishing Bay tributary, is one of their new ventures—a hatchery and nursery where seed (baby) oysters are spawned from special broodstock, raised on a diet of cultured algae and creek water, and sold to fellow oyster farmers. It’s the first commercial oyster hatchery in Maryland. The firm employs 15 full-time workers to run three operations: its original oyster farm/headquarters at Hoopers Island, the hatchery/nursery, and an equipment manufacturing and distribution center in Cambridge. In an era when the Chesapeake’s commercial fisheries barely sustain a traditional way of life, the story of Shockley’s transition from conventional seafood gatherer to innovative seafood grower is a tale for challenging times. Frustrated with crabbing prospects but unwilling to quit, Shockley seized serendipity. The Maryland legislature, habitually cold-footed about pushing wide-scale private oyster culture, warmed to the notion in 2009 as commercial harvests continued to hover at a fraction of historic numbers. A modest leasing program had existed for more than a century, but special interests always thwarted its expansion. In a turn-about, legislators lifted long-standing county moratoriums (including Dorchester’s) and other impediments to private leasing and established a licensing process for anyone interested in growing oysters on barren or no-longer-productive bars. They began accepting new lease applications in September 2010. “We basically removed a bunch of barnacles from the laws,” explains Don Webster, a University of Maryland extension agent who specializes in marine aquaculture. In addition to scrubbing away tenacious moratoriums, the state undid a previous ban on corporate leasing and required private leaseholders who aimed to stifle aquaculture by “sitting” on their leases to either use or lose them. “My head was not in oysters when I went there. I went to hear what they had to say and they got me interested enough to go home and get on the Internet and look at what Virginia was doing with the triploids and the diseases,” Shockley recalls. Months later, driving through a snowstorm, he attended the Maryland Watermen’s Association trade expo in Ocean City. He listened to the biologist, Dr. Standish (Stan) Allen, discuss the triploid oyster he’d developed and tested in his lab at the Virginia Institute of Marine Science (VIMS) and in Chesapeake field trials. Lacking the requisite even number of chromosomes to reproduce, triploids divert their energy to fattening quickly—faster than diseases can kill them—and they stay plump during the summer when fertile oysters sacrifice their physique to procreation. Spawned using a patented laboratory process, the three-chromosome triploid, which can be raised and marketed year-round, has revolutionized oyster growing. Shockley envisioned a tantalizing but potentially risky new career. Before he committed, he had a question for Allen: Could the scientist guarantee that the Bay’s deadly oyster plagues, MSX and Dermo, would not kill triploids before they reach market size? I give you my word, Allen told him. “That was one of those moments,” Shockley recalls. “When he said that, I was all in.” He and Fitzhugh applied for their first lease: five acres in Tar Bay within sight of the house in which Shockley grew up in the Upper Hoopers Island community of Fishing Creek. It took 18 months for the paperwork to work its way through state and federal channels—less time than it usually takes one of Shockley’s oysters to grow from larval infancy to edible adulthood. At the Crocheron facility, Shockley introduces a pair of biologists who help run the operation. One is his son, Jordan, who, encouraged by his father, took a different path into oystering. While earning his degree from Salisbury University, Jordan worked at Maryland’s state-run oyster hatchery at Horn Point near Cambridge. Another biologist is Natalie Clark, a Dorchester native and Randolph-Macon (Virginia) College grad who left a laboratory job to return to her roots. She manages the nursery. Both are busily handling the demands of “seed season,” when growers clamor for shipments of the babies as fast as they reach sellable size. The oysters begin life inside the hatchery, where they’re spawned from VIMS broodstock and then reared by the millions in 1,500-gallon tanks. Shockley and Fitzhugh bought the modern-era building and surrounding acreage from a watermen’s nonprofit whose attempts to farm oysters and build a marina bogged down in red tape. Minor modifications had the hatchery up and running quickly. Taking sperm from Allen’s laboratory creation, a tetraploid (four-chromosome) oyster, the hatchery fertilizes eggs from diploid (two-chromosome) females to spawn triploids. (Broodstock are used under a contractual agreement that nets VIMS royalties with which to continue its research.) About half of the fertilized eggs will survive to become larvae. The larval oysters consume algae the hatchery grows in walk-in coolers once used for crab processing. Jordan Shockley ushers visitors into one lined with shelves holding beakers of yellow, lime-green and brownish-green translucent liquids. Unlike most dimly lit walk-ins, these glow under an array of bright tube lights. After five or six days, the starter algae is transferred to another walk-in, where floor-to-ceiling plastic pouches supported by wire cages hold murky liquids dense with algae. Overhead piping transports the oyster Pablum directly into the rearing tanks, each of which holds 500 million free-swimming larvae. When they’re ready to set, the larvae are moved to the outdoor nursery, where they attach and grow in a series of open fiberglass “upweller” tanks filled with circulating creek water. The tiniest animals are detectable only by touch—Braille-like bumps on the sides of their containers “But they grow like weeds,” Clark says, graduating with their size cohort from one upweller to the next. He developed a theory: With crabs and rockfish overfished, the decline of oyster stocks was a backbreaker. “We lost the third leg of our seafood industry,” he says. Bring oysters back and you revive the other two fisheries, he believes, restoring the Bay and re-employing watermen in the bargain. “If we’re going to move forward with the next generation of watermen on Chesapeake Bay, we’ve got to develop a more sustainable, solid way to make an oyster industry,” he says. “And there’s no better way to do that than what the science is telling us.” Science told Shockley that the future was Allen’s “master mollusk,” the triploid. Since their initial meeting, the two have stayed in touch. The waterman-oyster farmer calls the scientist “the godfather of oysters” and Allen praises Shockley as an aquaculture evangelist. now leases his own oyster grounds. According to Maryland’s Department of Natural Resources, 80 percent of the 260 oyster leases issued since September 2010 are held or jointly held by watermen. Some, like Shockley, own more than one.Shockley’s father, long-time waterman Dorsey Shockley, was skeptical as his son pondered an aquaculture career. But he came around. When he died two years ago at age 76, the elder Shockley was working alongside his son and grandson, just as Johnny had joined Dorsey selling crabcakes and family recipe crabmeat-stuffed deviled eggs at their Chesapeake Treasures Seafood. Aquaculture has its critics. Some watermen, wary of competition, file objections to new lease applications. Shockley publicly sparred with the Maryland Watermen’s Association when it opposed off-bottom aquaculture on behalf of commercial clammers, whose territories are less codified. He says it’s essential that watermen acknowledge over-fishing’s role in the industry’s decline. And he believes aquaculture and traditional fishing can co-exist. As gulls squawk overhead, Shockley walks down the nursery dock to demonstrate one of his prized innovations and a company top-seller, a floating upweller that he redesigned for better efficiency. Proceeds from its sales buoyed the company’s early cash flow. En route, he chats up a neighboring waterman whose workboat ties up here. They commiserate about recent poor crabbing, which the waterman attributes to the crabs’ early migration last fall, a hard January freeze, and spring temperatures that leapt from cold to hot. “It’s like God forgot us here. You get one or two things that get you, you can handle it. But that third one will get you every time,” the waterman says, unconsciously echoing Shockley’s tripartite theory of the entire industry’s tipping point. The hatchery/nursery runs full-tilt most of the year, but can it employ enough people to revive Crocheron? No, Shockley concedes, “but a large one could.” He’d like to buy the abandoned seafood plant next door (the old Bradye Todd packinghouse, a major employer in the 1940s and ’50s) and demolish it to expand his business. As part of its initial Crocheron purchase, the company already has 350 acres of oyster leases on Fishing Bay and has applied for five acres more. The company’s first harvest, 2012, was about 200,000 oysters; last year it was 3 million. Marketed under the Chesapeake Gold label, the oysters are sold to distributors supplying numerous Bay restaurants and raw bars. About 30 million seed oysters were sold last season, the hatchery’s first full year of operation. The company also makes and distributes an array of products for growers, from a free-pivoting hexagonal oyster basket developed in Australia to a mechanical oyster tumbler/sorter engineered by the company’s equipment production manager, John Toll, a former boat fabricator and accomplished welder. Company consultants help fellow aqua-farmers set up, equip and run their businesses. Shockley still lives a waterman’s life, piloting the family-built Bay deadrise Mis-Jon (named for him and his sister, Missy) to check his oysters. On a balmy day in Tar Bay, he maneuvers the workboat above a bed of 2.5 million shellfish growing in bottom and floating gear. Crewmen hook one of the cage lines and a winch lifts the dripping, wire-mesh basket onboard. They remove the lid and a brackish tang fills the boat. Packed with the upturned shells of about 1,000 small oysters, the cage gets Shockley’s critical eye. Planted last October, it’s become overcrowded, he says, and needs to be thinned. Nonetheless, by year’s end he’ll be marketing these oysters more reliably, profitably and sustainably than he did wild ones. “We have to re-establish the oyster industry so it’s sustainable, and we need to do it by economic incentive,” Shockley says. It’s his gospel, one he preaches at professional seminars, community gatherings and tours of his hometown business. CBM contributing writer and oyster-lover Marty LeGrand has been covering boating and environmental issues since 1996.